At some point or another, we are sure that you’ve seen the signs reading “Keep Off The Grass” posted in yards and wondered why they were necessary. After all, does it really matter if people walk on grass? However, there is actually a great reason to not walk on the grass in your lawn, especially during the winter season. This tactic of keeping off the grass may actually be able to provide you with a better lawn next spring. Let’s talk about why it’s necessary. What Happens To Your Grass During the Winter? When winter arrives, your grass becomes dormant. This allows for it to remain safe during extreme temperatures. This occurs during the hottest periods of summer as well. When this happens, your grass immediately becomes more vulnerable to damage. 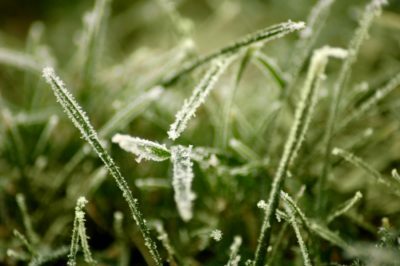 When frozen, grass can become brittle and break off very easily which is why stepping on it causes a world of hurt. This is because the head of the grass, also known as the “crown” is crushed and therefore can no longer support grass blades. This means your grass won’t be capable of recovering in the spring once the warm weather returns. At A&C Sprinklers, we have seen so many lawns unable to rebound in the spring because of people excessively walking on them. The best advice? It’s a simple as the sign says – Keep Off The Grass. You’ll be happy you did once the warm weather appears again. Check back for more tips on taking care of your lawn this winter soon!